If we have friends over, guests love to just float in the pool in the chairs so that we can have an easy conversation. 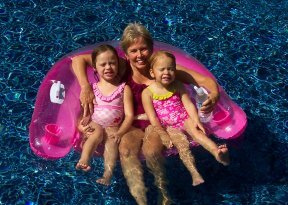 These types of swimming pool floats can be made out of inexpensive vinyl, comfortable fabric or out of the more durable, and expensive soft foam. Adjusts to different body sizes and weights thanks to adjustable straps that can shorten or lengthen the back piece and the bottom piece. It's really a very comfortable chair thanks to the headrest. If you want to really relax just sit back, rest your head and float. We really like having armrests on our floats. They just add to the feeling of comfort and relaxation. Deflate the tubes (their are 4 different bladders to blow up or deflate) and it can be easily taken to the pool, the beach, or put in a suitcase. Doesn't take up much space since the tubes are inflatable. 7. Affordable Less than $34. A bean bag pool float is taking over as the number one chair pool float and for good reason. The comfortable fade resistant fabric sure beats sticky plastic and the adjustable beads conform to any body shape making it the perfect chair for any size person. 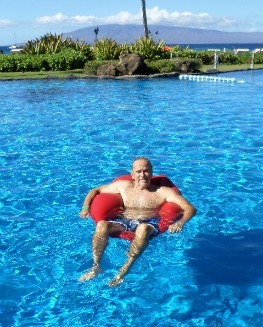 We enjoyed the red bean bag float at the Sheraton Hotel pool in Hawaii and haven't been able to find one just like it, but another option is a bean bag float that's shaped like a chair. These floating swimming pool chairs keep your legs dangling in the water to keep you cool, but your seat is not in the water like the chair with the mesh bottom. If you like sitting on top of the water - this is the one for you. When we have friends over to the pool, we like sitting in the floating chairs to keep cool and to keep the conversation going - better than being on a lounge float. Floating pool chairs are a big hit for an adult pool party. They keep you cool and in the conversation with others. We like these chair floats by Intex. They are nice and big and can handle any size guests (plus a couple of kids). The beverage holders are a nice added feature. We have lots of action at our pool with kids and adults. Because they are inexpensive (under $10) you can get a couple of them - at least 2. One for you and one for your friend. As you can see there is room for some little ones as well. The float is really big which makes it great for a big person. The downside is the chair need to be inflated and then deflated for storing. These floating pool chairs were used a lot, so for us, one lasted a full summer season and the other one two summer seasons before it developed a leak. The bottom piece separated from the sides. But I have to say we really enjoyed them. SwimWays makes a spring float chair called the SwimWays Spring Float Papasan. I like the feel of the mesh bottom rather than plastic. It's easy to get in and out of compared to a sticky plastic float. On a hot day it feels really good because you sit really low in the water. So if you want to keep cool this is a great chair float. Not much to blow up - just a few blows and to inflate the edge. It is almost unsinkable as well since most of it is a mesh bottom. It is easy to store and doesn't take up much space. We had a family over and the father was tossing his 5 year old son into the chair and it held up with lots of fun "abuse." Our two granddaughters like playing in it together. It also includes two very important features - a beverage holder and a headrest. If you enjoy floating and reading at the same time - this is a good float for you. I purchased two noodle chairs and two new noodles to have this summer when my niece and her family came to visit. They cannot be called floating pool chairs because they don't float - when my niece sat in it the water came up to her chin. So if you like almost sitting on the bottom of the pool and being almost completely submerged, you would like this float - if not get an inflatable chair instead. 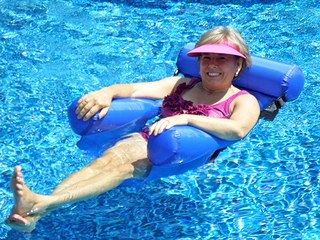 For those of us who enjoy relaxing in the pool floating pool chairs are a must!